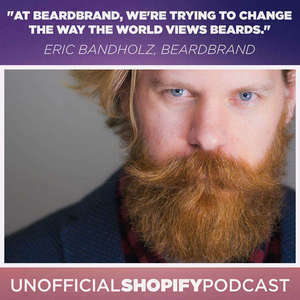 We talk with Eric Bandholz of Beardbrand on how we went from community to business. Growing slowly and organically at first, and eventually blowing up into a bearded sensation that's sparked copycats and inspired thousands. "At Beardbrand, we're trying to change the way the world views beards." Eric is a self-described "husband, father, entrepreneur, world traveler, ancap, designer and founder of BeardBrand." FirstName’s #1 tip for The Unofficial Shopify Podcast.